Supporting a glass tabletop on a bunch of balloons will likely end badly. In order to achieve this aesthetic without the shattered glass (and tears), designer Christopher Duffy has employed a bit of clever metalwork to create a coffee table that’s truly unique. Duffy’s appropriately titled "UP Balloon Table" is supported by steel rods meant to mimic the weightless strings of balloons. The balloons themselves are sculpted from a metal resin composite, and they're strong enough to support the toughened glass tabletop that sits above them. The illusion is impressively convincing, and we promise that resting your coffee on the table won’t send the whole thing crashing down. 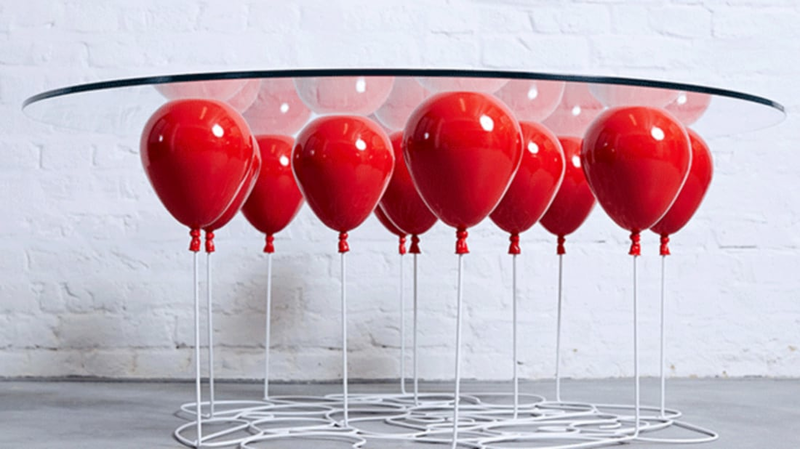 The whimsical furniture piece comes available with red, gold, or silver balloons. For an approximate price tag of $11,750, you can order a table of your own from Duffy’s website. Images courtesy of Christopher Duffy.